Anyway, on to the business of the day! When I read Tuesdays at the Castle by Jessica Day George, I loved the concept of a sentient castle, constantly remaking itself. 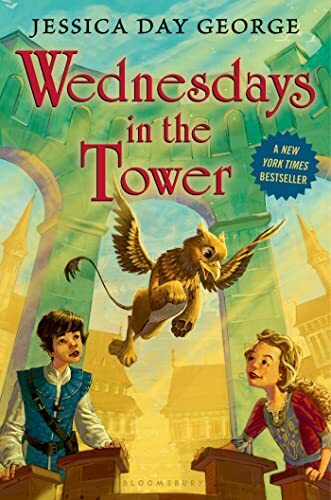 So I was excited to revisit Castle Glower in Wednesdays in the Tower (spoilers to follow for the first book in the series). This fits Once Upon a Time, and my goal to read more sequels. Princess Celie knows Castle Glower, and its quirks, better than anyone else. But even she’s not sure what it means when the Castle shows her a new tower, with a mysterious orange egg in it. The egg hatches into a griffin–and Celie finds herself trying to raise a mythical creature in a castle that won’t let her reveal the griffin’s existence to anyone except her wizard brother Bran, and his friend Pogue. Celie does manage to enlist her younger brother Rolf in helping her look for any information on griffins, which seem to have mysterious ties to Castle Glower’s history. Meanwhile, the castle begins behaving increasingly erratically, and a very ominous wizard has arrived to look into matters. The Castle was my favorite part of the previous book, so I was glad to see it, and its mysteries, take such a prominent role in the sequel…I think! I’m a little worried that finding out too much (in the third book still to come) will ruin some of the mystery…but what answers we have so far are intriguing, so I’m optimistic! I felt like Celie grew as a character in this book, both through taking care of the griffin (who she names Rufus), and through trying to determine her proper place in the castle. At first she seems to have found that place, as the Castle Cartographer, but it isn’t long before she’s feeling shunted to the side and still looking for her role. Rufus is great fun as well, and rather adorable! It’s funny that I just read another book (The Pinhoe Egg) about raising a baby griffin, but this felt distinctly different. Rufus has a very different personality (even though, unlike Cat’s griffin, he can’t talk). I loved it when he started learning to fly, and was so eager about it! This sounds lovely and a sentient castle is intriguing. Not loving the sound of a cliffhanger but, I can always wait until the next book comes out! This sounds like such a fun read! I’m definitely adding it to my wish list. I keep a separate list of books that I think the grands will enjoy, and my oldest granddaughter is becoming quite caught up in fantasy. She is becoming a ten-year-old fantasy and fairy tale fanatic–and I love it! Oh! I just read a book by the same author, but it wasn’t quite up to my expectations. That being said, the idea of a sentient castle does sound fascinating – reminds me of Howl’s Moving Castle, though it wasn’t exactly the castle that was sentient. Sounds like a book I’d love to give a try, the first and then this one, of course! I’m curious what other book you read–I’ve read some of George’s others. This series has been a lot of fun so far!